Last July, when Affliction Clothing and Adrenaline MMA teamed up to promote the mixed martial arts event Affliction Banned at the Honda Center in Anaheim, CA, they wanted to put on a show unlike anything fans had ever seen. The night featured former Pride Fighting Championships heavyweight champion Fedor Emelianenko against former Ultimate Fighting Championships heavyweight champion Tim Sylvia. They were battling for the first-ever World Alliance of Mixed Martial Arts heavyweight title. Knowing the show needed to be just as cuttingedge as the event, Affliction hired Florida-based Innovative Show Design (ISD) to come up with a production that would keep people coming back to the sport and the Affliction brand name. In this four-camera view, the truss and lights are all clearly visible, allowing designers to see where each light is pointing.of the arena using Maxon’s Cinema 4D and Nemetschek’s Vectorworks. ISD uses pre-visualizations for all their show designs so clients will know exactly how their events will look in reality. “We did good designs before with Vectorworks,” says Nate Mitchell, ISD’s graphic supervisor, “but we started using Cinema 4D to do scenes a couple of years ago, and we’ve stayed with it because we love how it’s so true to life. While ISD’s sister company, Show Partners, did all the operations and engineering for the event, Mitchell teamed up with ISD’s artistic director Chris Runnells, lighting director Justin Garrone, and project manager/graphic artist Mark Dowling to design the lighting and media for the show. First, Runnells and Garrone, used the dimensions of the arena to make a 3D model of the space in Vectorworks. Once they were through, they passed the model on to Mitchell and Dowling, who brought it into Cinema 4D to add textures and lighting. They also created screen setups for later compositing of media in Adobe After Effects. This was a particularly fun part of the process, Mitchell says, because this was the debut fight for Affliction’s new promotion company, which meant the fighters didn’t yet have colors or fonts for their names, but they did have theme songs. “And we got to use those songs to come up with colors and fonts that matched,” says Mitchell. This screen shot offers a side angle on both the rig and the stage.Using Cinema 4D, ISD manipulated the lights in this view to see how they would hit the audienceeffects, ISD built a custom Versa Tube wall behind the stage where Megadeth played just steps from the ring. The tubes were then hooked up to the media server, allowing ISD to throw the Affliction logo and the fighters’ names and colors onto them to create an everchanging graphic display. Names and colors also appeared on an LED matrix ring that ran 360 degrees around the stadium with more media appearing on the arena’s Jumbotron. A view of the light plot shows 36 lights on each of the inner trusses.“One of the things we like most about Cinema 4D is we can throw in hundreds of lights and it’s still easy to work with,” says Nate Mitchell.Mitchell and Garrone have worked hard to create a library of lights, textures, and furniture that they can use when designing shows. 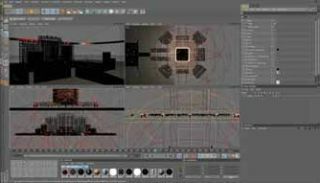 Made with Vectorworks, pieces from the library are brought into Cinema 4D for texturing using the Vectorworks plugin. The Affliction scene, for example, contained 5790 objects ranging from lights and Versa Tubes to bleachers, stadium seats, and ropes. ISD works closely with clients throughout the design process. Once the previsualization is complete, clients are sent stills of the scene to comment on. Next, ISD uses Cinema 4D to make clients a short movie (about 45 seconds to a minute) showing all aspects of the scene. Each movie begins with a flythrough of the set, starting with a high wide angle and zooming in to show the overall look. Edited in After Effects, the movies are created in full HD and scaled down before being sent. in the 3D model of the arena floor, though Affliction chose not to use them in the actual show.